Electronic music duo, Daft Punk, premiered a sneak peek of their new single and video, “Get Lucky” featuring Pharrell, during a Saturday Night Live ad and at Coachella. In true Daft Punk fashion, the twosome infused ’70s Disco elements with a electronic techno spin. 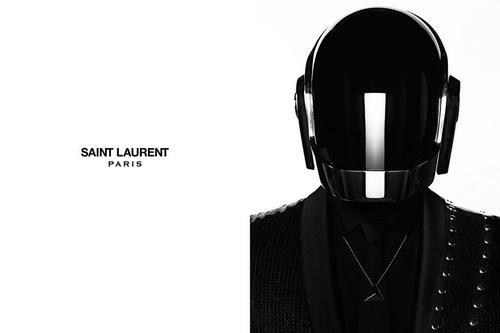 The song will be featured on the legends fourth studio album, “Random Access Memory” in stores May 21. Note their usual classic suit and tie -ish has been replaced with the Glitter “Le Smoking” Jackets, a sequin, all black twist to the classic blazer, courtesy of Hedi Slimane and the good people of Saint Laurent Paris. 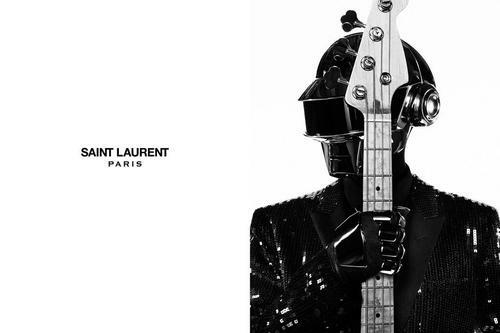 The collaboration with the former YSL house started October 2012 when the group was commissioned to create the soundtrack for the inaugural Saint Laurent fashion show. The electrolites join Courtney Love and Marilyn Manson with ad campaigns currently filling the pages of your favorite fashion bibles. Music and fashion? This is the stuff I live for!! !